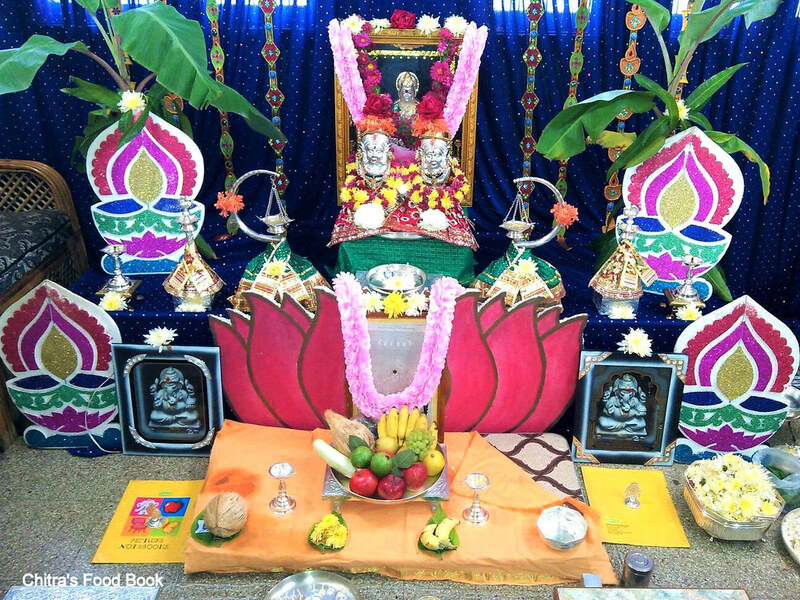 In this post I have shared how to do Varalakshmi vratham Pooja at home with details about the decoration, things needed, requirements for pooja, slokhas, Varalakshmi viratham neivedyam recipes and also about a simple Varamahalakshmi pooja at home for first timers. Hope beginners would find this information useful to you.This year Varalakshmi pooja falls on Friday, August 24,2018. Varalakshmi Vratham/Varamahalakshmi festival is the most auspicious festival celebrated by married woman(Hindu) to commemorate Goddess Mahalakshmi. "Vara" means "boon" and Goddess Lakshmi grants all boons to those who performs pooja with utmost devotion on this day.Varalakshmi Vratam is a most popular festival in South Indian states like Andhra Pradesh, Karnataka, Tamilnadu & North Indian states like Maharashtra & Orissa.Worshipping Goddess Lakshmi on this day is equivalent to worshipping Ashtalakshmi ( 8 Lakshmi)– Goddesses of Wealth(Shri), Earth(Bhu), Learning(Saraswati), Love(Priti), Fame(Kirti), Peace(Shanti), Pleasure(Tushti) and Strength(Pushti). This pooja is performed for the well being of family members especially for the life of Husband & to get children,Wealth etc.Every year Varalakshmi Vratham is observed in Sravana(in Telugu) month(Avani in Tamil & Sawan in Hindi).It is celebrated on Friday preceeding the full moon day(Pournami).Those who cannot perform it on that day, can do it on any other Friday in that month.On this day, married woman should observe fasting till they finish the puja. In my family,both Mom & MIL don’t have the practice of doing Varalakshmi Viratham but every Friday we used to do Vilakku poojai for Goddess Mahalakshmi. But still I am making this post as per a reader's request. 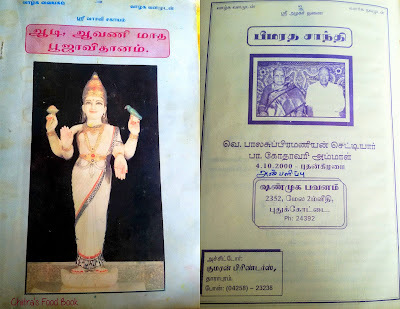 A reader from Chennai mailed me to share the details of Varalakshmi Vratham with pooja vidhanam/procedures and slokas as she is a beginner.So I thought of asking my friends who perform Varalakshmi Vrata every year in a grand manner.For making this post,I took the help from two of my friends Shalini and Archana. When I told them about this post,they became very happy and shared their pooja procedures along with their Varalakshmi decoration pictures.Shalini gave me a book titled “Aadi, Avani maadha Pooja Vidhanam” in which all the important festivals like Ganesh Chaturthi, Varalakshmi Vratham, Naga Chathurthi and Garuda Panchami were discussed in detail with slokhas in Tamil.Not just that, Shalini spent nearly 3-4 hours over phone ,explained each and everything about the pooja while I was drafting the post.Without the help of Shalini, this post would not have come up in my blog. I must really thank God for giving me such a helpful friend in all aspects of my life. If you are a beginner and looking for Varalakshmi pooja slokas in Tamil, right click on the images and click "Save as", download and save them in your mobile or PC and chant these slokas while doing the pooja. I have also shared some audio, video links for people who look for Varalakshmi vratham pooja vidhanam and idol decoration in Telugu and Tamil .Please scroll through the end of this post to check the links. Lets see the Neivedyam recipes list, pooja items requirements list, Things needed for pooja, Pooja procedures,Varalakshmi vratham story and slokhas for Varalakshmi Vrata in step by step. Pic courtesy – My friend Shalini made God's face with turmeric powder. 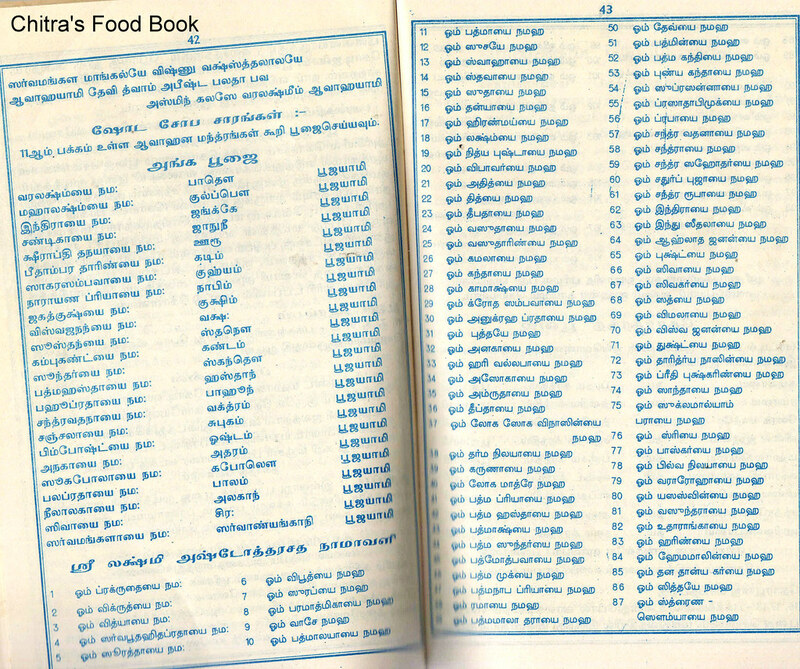 Let me start with the list of Neivedyam Recipes. You can make any 5, 7 or 9 dishes for count. Neivedyam recipes ( Idli, Sweet pooran kozhukattai ( poornam borelu), ellu kozhukattai, Karjikai/fried sweet samosa, Chitranna, Payasam, sweet appam ( based on your tradition). Thamboolam set of kumkum,chandan,bangles, Betel leaves and nuts, Yellow rope, blouse pieces, coconut, banana along with 1 rupee coins) – Make them ready as per the number of ladies you invite. Ready made(plastic) cups and bowls for distributing prasadam. Mahalakshmi stothram book or download the images I have shared here. 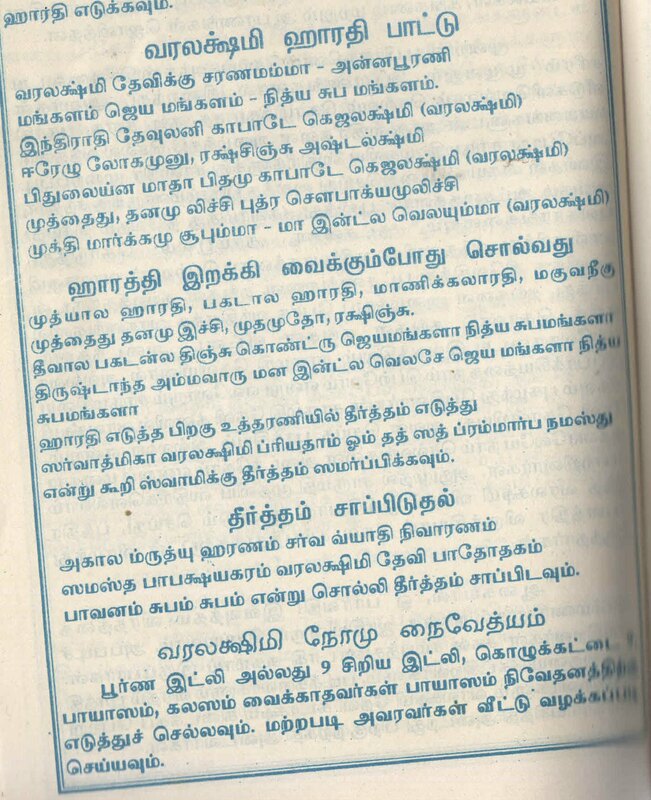 The slokas I have shared here is from a book titled "Aadi avani maadha Pooja vidhanam".This book was given as a compliment for my friend's mom in Pudukottai and it was published in the year 2000.I don't think whether this book is available in the market.But I am sure you can get the book for Varalakshmi vratham with story,Mahalakshmi Ashtothram in Giri trading agency. I have shared the title pages of book as per a reader's suggestion.Please leave a comment in the feedback section if you get any books of this kind.It would be useful for all the people landing in this page.Thanks ! Please click on the image to see the bigger sized picture. On Thursday morning,wash all the pooja vessels and kalasha pot.Wash the lamps, keep kumkum dots and put threads.Oil the lamp and keep it ready for the next day use.Make the thoran and pongu nool and arrange the other pooja things in a plate. You can also prepare the stuffing for sweet pooran kozhukattai,soak the pulses for sundal and grind the batter for idli. 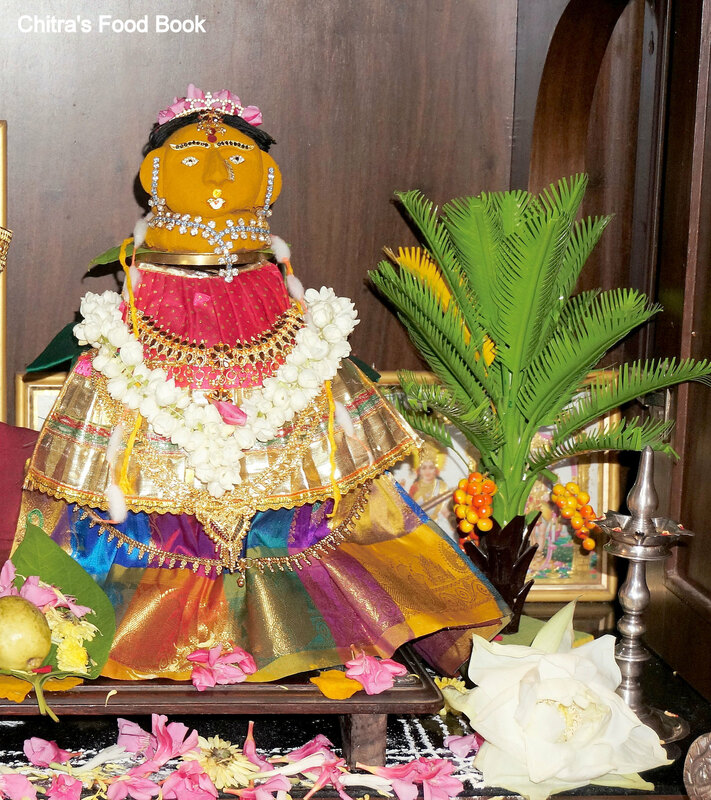 On thursday evening around 5.30 pm, sweep the entrance of each room (Nilai padi/vaasal padi).Apply turmeric on the sides and draw 2 lines using kumkum.It is partitioned into three divisions.Put chandan & kumkum dots.This pooja is done to welcome Goddess Lakshmi and it shows the beginning of next day function.Light the lamp, perform pooja by keeping some neivdeyam like sundal , sweet appam etc. 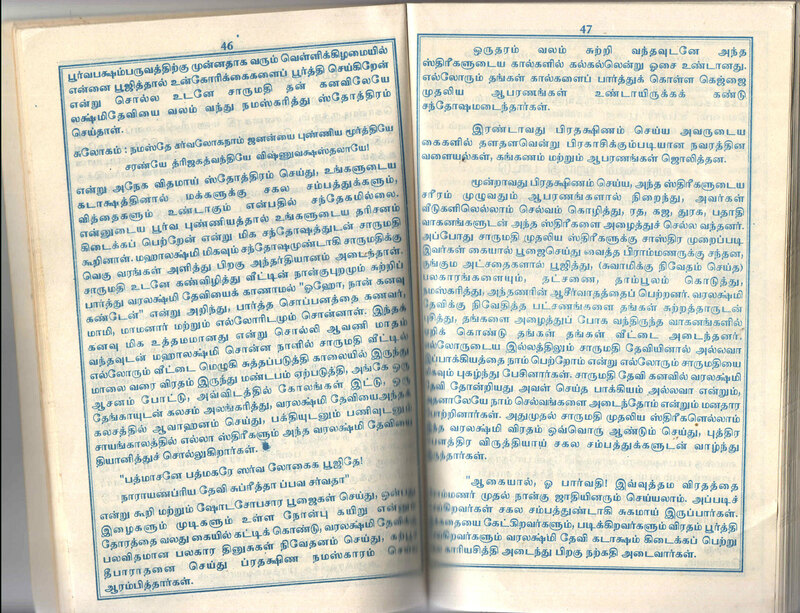 Read the Varalakshmi Vratham story. 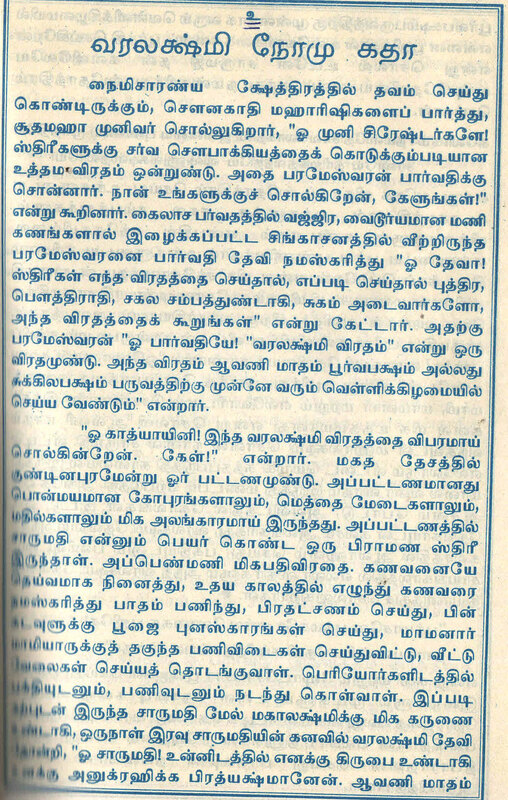 I have attached the story picture in Tamil. Please refer it. Some people read the stories on Friday after completing the pooja.So its your choice. You can also keep the manai/Wooden plank/Peeta and place a banana leaf over it.Spread the raw rice and keep it ready for next day’s pooja.Remember you should not keep the kalasha now.It should be kept only on Friday. Please click on the image to see the bigger sized picture. The story happens in a beautiful town called Kundinagaram located in the Kingdom of Vidarbha /Vidharba Rajyam. In that Kundinagram town, Goddess Adilakshmi, being pleased by her devotion tells Charumathi in a dream and directed her to perform the vrata to enable her to fulfil her desires. Charumathi wakes up and tells her husband about the dream. Charumathi along with some neighbourhood women takes bath in the early morning hours and prepare a mandapam and invites Varalakshmi Devi. She recites the following sloka along with other women with utmost faith and devotion. Then she wore nine threads / Thoranam to right hand and offers naivadyam to Goddess Lakshmi Devi. On the completion of the first circumstance, she heard she found Gajjelu, Andelu and other ornaments. On the second circumstance, they found kankanams made of navaratnams to their hands. On completion of the third circumstance, they found immense wealth. Then Charumathi offers Tambulam to the brahmin priests and distribute the vrata prasadam to the relatives and lead a happy life. Since then, Hindu women perform this vrata with utmost faith and trust till today. 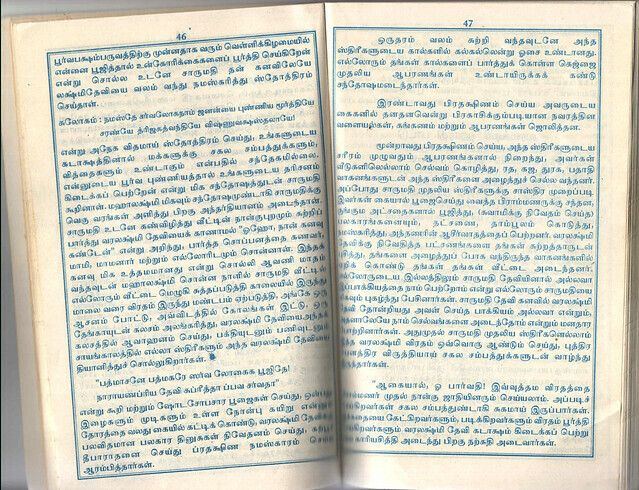 With this, Lord Eswara concludes telling the story to Goddess Parvathi. Thoram and Pongu nool are nothing but the sacred thread smeared with turmeric powder.Thoram is made by taking 9 strings of thread.Put 9 knots in equal intervals.The number of thoram depends on the number of ladies & young girls at home.Thoram has to be tied around your wrist and Pongu nool is nothing but a single thread smeared with turmeric powder.You should tie it around your neck.Married ladies wear both Pongu nool and thoram whereas young girls tie thoram alone.Keep the thoram,Pongu nool,9 betel leaves, 9 betel nuts, 9 banana, 9 dates, 9 turmeric sticks, kumkum box,Karimani mala ( black beads chain) in a plate and keep it ready for pooja.You can do all these works on Thursday night itself. Fill the silver or bronze pot(kudum) with scented water (add cardamom, nutmeg, edible camphor etc) till its brim.Some people add kumkum, turmeric powder, dry fruits in the water. Some people have the practice of keeping raw rice, 1 lemon, 9 betel leaves(vetrilai), 9 betel nuts, 9 turmeric sticks( manjal kizhangu), 9 dry grapes, 1 moulded jaggery ( Achu vellam), dry fruits & a karimani mala (black bead chain), coins inside the kalasha instead of scented water. So please make the kalasha according to your tradition.On the top of kalasha, place 5 mango leaves( keep in odd numbers) and keep a coconut smeared with turmeric.The tail portion of coconut should face upward.Kalasam should face east. After making the kalasha, keep a kumkum dot and keep aside till u make other arrangements. The next day i.e Friday,after taking bath, wear a silk saree and some gold ornaments ( old or new). Wash the place where the pooja is going to be held. One should observe fasting till the Pooja is finished( Elderly woman can have milk and fruits). Draw rangoli using rice flour and place the peeta/Wooden plank/Manai OR Big plate/Thambaalam.Spread a banana leaf and put some raw rice ( If you have done this on Thursday night, skip this step and proceed to the next step). Place the kalasha over the rice. Cover the coconut using a new blouse piece( made into cone shape by referring the video link given below). To this coconut, an image of Goddess Lakshmi is fixed or the image of Lakshmi made using turmeric powder. My friend makes the face of Lakshmi using turmeric powder as shown in the second picture. In some areas, women place a mirror behind the kalasham. Today, there are specially made Varalakshmi pots and faces available in the market.So you can buy and fix it with the blouse piece.Now the kalasham symbolically represents Goddess Lakshmi. Decorate the idol with dress and Jewelries and garlands.You can dress it with a tucked saree or skirt (Pavadai).Put some jewels (Preferably gold) and tie a pongu nool around the neck.It is considered to be the Mangal sutra(Thali) Keep chandan & KumKum dots.Now Goddess Lakshmi idol is ready to perform pooja.Make a cone shaped Ganesh/Pillayar using turmeric powder mixed with water and keep it near the kalasha.Light the lamps at the time of pooja and start doing it. Please refer this video for decorating Goddess Lakshmi Idol. Any auspicious festival should be started with Lord Ganesh pooja.So make a small cone shaped Ganesha using turmeric powder ( Manjal pillayar). Place it near the kalasha. Read the sthothram given below and worship Lord Ganesha to do this pooja without any obstacle and after chanting the sthothram, move the Ganesh towards North direction. 2: Who is Having a Compassionate and Gracious Face, Let us Meditate on Him To Ward of all Obstacles. After finishing Ganesha pooja, take some flowers and akshatha in hand and chant the Avahanam slokha.Visualise Goddess Lakshmi in mind and offer the flowers and akshatha to kalasha. Goddess Lakshmi is invited to our house. Meaning: Goddess Lakshmi, who is the daughter of the king of the ocean of milk, whose abode is Srirangam (with Lord Ranganatha), who is served by all the divine ladies in heaven, who is the guiding light for the world, who has obtained the sustained (continued, everlasting) glance (Grace) from Brahma, Indra and Shiva, whose abode is the three worlds (Bhu, Bhuva, Suvaha) - I offer my prostrations to Thee, the beloved of Lord Krishna (Mukunda). 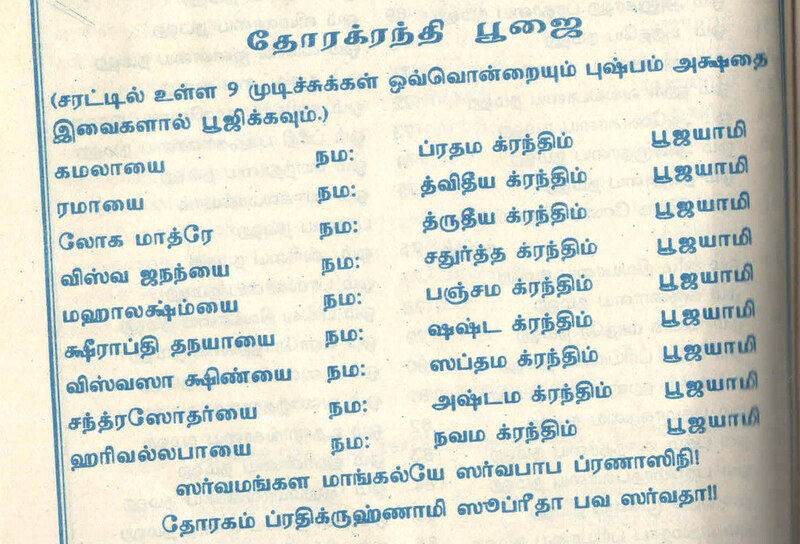 Now perform Anga Pooja( Worshipping each body parts of Lakshmi).Offer flowers to Kalasha by chanting Anga pooja sthothram.Refer the picture below for Anga pooja Sthothram in Tamil.Please refer this link in Hindupad for sthothra in English. Following this, chant Lakshmi Ashtothram(108) by offering flowers to Kalasha. Proceed with thoram Pooja/Nonbu Saradu poojai which is known as Thorakrandhi pooja. Finally, Mangala Harathi is performed for the kalasha.Different types of sweets/neivedyam are offered in front of the God.Nonbu saradu/Thoram (yellow thread) should be tied on the woman's right hand and Pongu nool should be tied around your neck.You can ask your Husband to do this.At the end, take harathi by mixing turmeric & kumkum in water.Sing the Harathi song while taking Aarathi. If you have not read the Varalakshmi Vratham story on Thursday, do it now. Offer the Thamboolam – Coconut, betel leaf and nuts, turmeric sticks, kumkum, coconut along with flowers, blouse piece, mirror and comb is offered to women in the locality and in the evening an Harathi is offered to Lakshmi with some neivedyam. Some people remove the kalasha on Friday night. But my friends told me to do it on Saturday. On Saturday morning, after taking bath, perform a pooja for the kalasha.Then dismantle it at auspicious time of the day. Consume little water as theertha. Sprinkle it all around in the house. Then pour the remaining water in well, trees or tulsi plant. If rice is used in Kalasha, mix it with rice in the house. If you used coins, keep in the locker safe. You can remove the nonbu saradu/Pongu nool and thoram after 3 days or on Saturday. If you want to strictly follow all the rules and methods of Varalakshmi Puja, then it would be wise to take the advice from an elderly woman who is regularly performing the puja. What I have shared here is purely based on the procedure given in the book and pooja methods shared by my friend Shalini. It may vary from place to place and tradition.Thanks for visiting this page. Please write few words in the comment section if you find this post useful. I will be more happy to know it. Last but not the least please find the links which I felt them useful for beginners. This VIDEO will help you to decorate Lakshmi Idol & placing Kalasha. If you want to do the pooja by listening to slokhas chanted by a Priest,please refer this AUDIO, AUDIO & VIDEO , THIS VIDEO for Telugu Version.You can just follow the instructions and perform pooja. Listen to THIS AUDIO for Tamil Version. Some people don’t have the practice of Varalakshmi Vratham but still they may like to perform this pooja in a simple way.For doing a simple pooja: Light the lamp,keep some neivedyam and do the pooja by chanting Mahalakshmi Ashtothram.Distribute the Thamboolam and prasadam by inviting married woman to your house in the evening.There are no hard and fast rules in performing the Varalakshmi Puja and you can be flexible on the puja items. Even a simple prayer will please Goddess Lakshmi. On this auspicious day,lets pray Goddess Vara Mahalakshmi to bless us with peace,health & wealth !! She has been doing this Pooja since 27yrs.Thanks a lot for sharing this valuable information mam. if any close relative from in-laws side dies, we should not perform full puja BUT on the festival day one must take out Amman moham and keep in silver glass or panchatram with rice, tambulam, coin in it in silver or peetalai / brass plate with banana leaf below. Yellow thread should be kept in amman, neivedyam should be done with fruits, beetal leaf, supari, manjal. After that tie sharadu in your right hand. Please go through the comments section for frequently asked queries and answers. Experienced people, do share your pooja methods with us, it will help everyone. Thanks ! Wonderful post with such detailed instructions...appreciate your patience in posting this...Hats off to you chitra.. 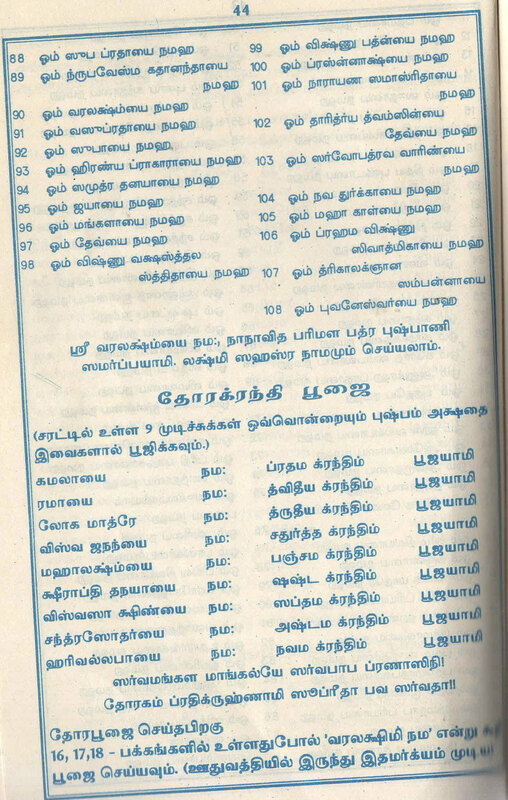 I need the above tamil book how do i get download link..? Hello, The above book was given as a complimentary. I have shared the printers details. But its a very old book. I don't know whether this print is available now. Whom to wear varalaxmi nonbu rope? It should be tied by the person who is doing the Pooja. They should tie by themselves. Really its awesome, I never seen this much detailed information without doing, ur posted for readers request its great. Ur information are very useful to beginners, thank you so much I am also going to do this pooja I was thinking how to start what procedure its really very useful. But I have one doubt, I have gayatri devi silver statue can I proceed this same method, r v have to do like wt ur doing in coconut. Tats nice, thank you. Its really very clear & nice explanation. Pls can u tell about coconut.what I have to do that coconut...it's my first pooja. I searched many blogs I found this blog have all info for plus thanks. 1.when to remove nombu kayiru? 2.we don't have many neighbours so can I distribute thambulam to women in temple after doing my pooja at my home? 3 I plan my pooja in evening when is the right time to do it? 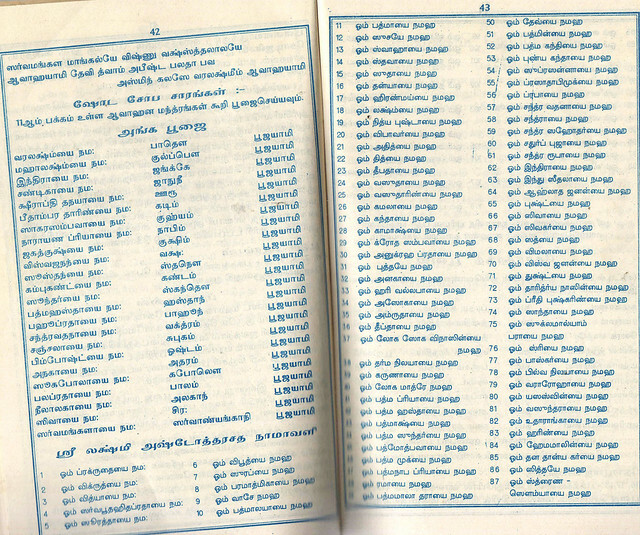 2.You can distribute the thambulam for women in temple.It is also auspicious. 3.Evening is the right time/best time to perform this pooja as mentioned in the book.But please take bath and start doing the pooja.So you have to bathe twice.To avoid this,many ladies do the pooja in the morning as soon as they take bath :) Hope this helps you.Thanks! Thank you very much for the detailed and helpful post. Thanks for the post. Useful. Can you please give me the details about the book you have taken copy. Please give me the title of the book and the publisher name . You can also give a copy of the the front title page. Easy for us to buy that book. Hello sir,Thanks for the suggestion.I have attached a picture of the book in the post.Please have a look at it.This book was given as complimentary gift to my friend.So it was specially prepared for that.Please enquire in some popular book shops or Giri trading agency for Varalakshmi vratham book with story.I guess you will get it.Thanks. Wonderful post..thanks for sharing...really very useful and a nice gesture from you..
1. Do we need to buy new saree for Goddess? 2. What to do with the saree after removing kalasam? Should it be given to temple? Hi, Its good to buy a new saree. After wearing the saree, you can use it for yourself. If its a small saree or skirt, use it next year. No need to give to temple. One can observe fasting by taking milk & fruits alone.Some people observe fasting by having tiffin for breakfast & lunch. They avoid taking rice. For elderly people and pregnant women, fasting is not necessary. Hi chitra I am so so glad to comment here and thanks to the core...I was searching varalakshmi viratham procedure in many sites and confused a lot...both my mom and mil doesn't know this procedure...so wanted to know this so badly and now ended with success by visiting this post....thanks again...one doubt both kalasam and goddess face should be silver or bronze that too a new one or shall I use my old kalasam? Also should I decorate the goddess only using gold ornaments?? In fact my friends use all designer, covering jewelleries that looks attractive :) Refer the above pictures. Hello Chitra. I am Mounika. Thanks for your valuable information. I got married in February 2015. I didn't perform my first year varalaxmivrath after my marriage. Can I start vratham in this year that is second year of my marriage. Please reply. Hi, I asked my friend about this. She told you can start pooja either by first or third year and not in second year. Sorry..
Again one doubt if me and my mil were in same home then we should make two idols like your friend archana?? Hi,Not necessary. Actually one is yamuna and other one is lakshmi in the picture. If you wish, you can keep two as well. Im glad to intro myself Divya. we, that in my family my mom was doing this from past 15 yrs. im also continue doing it after marriage. your blog about this varalakshmi viradham was very nice and useful too. i have one doubt, - we are in share accommodation, it is impossible for me to invite them to home. so im from past 6 years. i will prepare as you said, i will distribute the thambulam with persatham by taking it to their houses - Is it fine. or should i call them here. i will continue fasting till distribution was finished. after finishing pooja i will start doing this distribution. im not doing distribution in evening. If you do pooja by keeping idol at home, its auspicious to invite married ladies to your house and give thamboolam. If you are just doing a simple pooja, then you can distribute prasadam and thamboolam by going to their houses OR you can take everything to a nearby temple and distribute there too. Once you finish the pooja, you can have the food. No need to wait until prasadam distribution. For amman's hands, you can put bangles either gold or glass. Here readymade small sized mangalyam is available in pooja stores. You can buy and wear that. If its not available in your place, you can put a gold coin in yellow rope as u said. Very detailed explanation . I have been celebrating this pooja for the last 10 years with my mother-in-law, but we used to do the pooja with my lakshmi muham and kalasam as she had not brought her muham and kalasam with her when she visited us. Recently my mother-in-law has got her own kalash and muham as well. Do we keep both the muhams in 1 kalash ? Also, maybe I would not be able to do the pooja this friday, is it alright for me to do the pooja with my kalasam and muham next friday . My mother-in-law will do the pooja this friday with her muham and kalsam. Please advise. Very confused here. My mother does not have this pooja and hence can't help me out here. Hi, I have mailed the details to you. Thanks. Shouls i need to tie the nombu rope the poojs day ? Yes, you should tie the rope after finishing the pooja and before taking harathi. Very nice and detailed explanation for beginners like me. Thanks a lot. But I am married for less than a year and some death has happened in family. So we have been instructed not to do any abhishekam or keep kalasha in any festival for a year. Now only myself and my husband stay in home. I don't know how to do pooja without kalasha. Can I just take bath, clean house, prepare naivaidya and do pooja.. Yes as told by your family, you should not celebrate any festivals at home. But just do a simple pooja by keeping some neivedyam just like your daily pooja. No issues. Hi, For the first year you din't keep kalasha and did the pooja. So this year, make a simple pooja.Next year,i.e 3rd year, keep the kalasha and start it. Hi Chitra, thanks for sharing very useful information. It is very helpful, what should I do with 9 leaves that we put on rice near the kalasa after the pooja, I saw one video in you tube, they dint mention anything about it. I think these leaves are different from thambulam leaves which we give for 9 married women.Please reply. The information you gave us clears lot of my doubts. God bless you!! You can put them in water or in thulasi pot.Usually thoram has to be removed after the pooja set up is removed.Its done on saturday.So remove the thoram the next day. Its just a turmeric thread. So it doesn't affect the baby i guess. Hi I am from south African. I have never missed a pooja, since my marriage. this year my father in law has passed on. can I still do the pooja. Sorry to say. You should not do the pooja this year. Thank u fr the info....i have velli mugam...should i decorate the kalasam also?? Just decorate it with flowers. Hi Chitra, Very useful post. How long should we keep the decorated amman? You can keep it till saturday morning. Do pooja with simple neivedyam in the morning and then remove it. Morning or Evening - Both would do. Actually evening 6pm is considered auspicious. thanks a lot chitra... !!! Kudos..!! Thank you !! Happy vara Laxmi vratham tomorrow! Hi Chitra , one quick question, since my marriage I am doing this pooja in the morning but tomorrow grocers shops getting betel leaves around 10 am., can I perform pooja in the eveng this time ? Hi.. Shall we keep only kalasham and perform pooja?? I don't have face..
Hi.. A quick ques.. Shall we do pooja with only kalasham as I don't have face.. Yes, you can do it. If possible, make a small face using turmeric powder. Successfully completed the pooja. Thanks Chitra. Hi Pavani, If you have not used the skirt for regular use other than wearing for amman, you can use the same skirt this year too else its better to buy an new one. Varalakshmi Pooja or Vratha is an auspicious ceremony performed by women before the full moon day in the month of Shravan ( July/August ) and this year it falls on 4th August. The Pooja is performed to take blessings of the Goddess Lakshmi, who is the consort of Lord Vishnu. Hi Chitra, very useful post. I have a doubt. I usually perform this Pooja in mil's place. (we both stay separately). I want to perform it in my house from this year. Mil perform it in her house. Is it okay if we both perform it seperately.no.2 my mil is not having a practice of keeping kalasam. So is it okay if I keep a Kalasam or should I follow her practice? Hi Kavitha, Thanks.1. Yes you can start to do separately. As you are staying in a different place, you can do it. 2. Usually people follow their elders pratice. If you wish to keep kalasham, then no harm in it. You can keep it :) All the best ! Thanks for the prompt reply Chitra. Hello ,very useful blog .i cleared lots of doubt but few doubts left. 1.as u said we should do pooja on 1st or 3rd odd no of marriage year.but i did 4th yr of my marriage is there any prob? This is my second puja. 2.After puja nxt day i kept that kalash with coconut in my puja room and keep doing puja with other goddess.this yr what i will do?will i place new coconut and do bisarjan of old one? 3.As am frm odisha i dont knw any mantra is it k to do pooja without mantra .i knw only few sloka. 1. As you had started unkowingly, its fine. You can proceed this year. 2. You can remove the kalash next day. Do a simple pooja in an auspicious time with some simple prasad. Then remove the kalash. Use the coconut for cooking and pour the water in tulsi or any tree. No need to keep the kalash. 3. No worries. You can chant whatever you know and do the pooja.If you want to read more slokhas, you can read it from online or you can just playback the slokhas in a player. Doing the pooja whole heartedly matters the most :) All the best ! Thank you very much Chitra for the detailed procedure. We dont have varalakshmi pooja at my mom's place. Last year was the first year I learnt how to do the pooja. My mother in law guided me. This year I've to do it myself and I'm little scared. Your blog has got me confidence. Hi very nice explanation chitra ji. Is it like we should use or tie a new saree or dress.or can I use a silk saree that is worn before. I have given in the post. Consume little water as theertha and pour the remaining in well, tree or tulsi plant. I just want to clarify you with one post, if any close relative from in-laws side dies we should not perform full puja BUT on the festival day one must take out Amman moham and keep in silver glass or panchatram with rice, tamulam, coin in it in silver or peetalai plate with banana leaf below. Yellow thread should be kept in amman, nevedyam should be done with fruits, beetal leaf, supari, manjal. After that tie sharadu in ur right hand. I am doing this puja since last 27 years. My mom n in laws told me all this. This yr though i dont hv this.hope this will be useful. Very informative for beginners like me. Thanks a ton. Can you be little more brief on " Thoram and Pongu Nool", please? I couldn't relate it clear. Thoram is made with muppirinool, 3 stringed threads. You should take 3 muppirinool and join together to make it 9.if you don't have muppirinool you can use any thin thread and make 9 strands . you should put 9 knots. Poongu nool can be made with single thread. Just apply turmeric and keep it. Hello Chitra.... Please give me another day or date to perform this varalakshmipooja. Hello, You can perform this pooja on 3rd friday of this month. Thankyou very much for ur kind response mam! This is my first year married life but i didn't perform this pooja due to my periods today? Will i perform this on next friday? Or next year? Yes, u can do it next week. Firstly very nice post and easy to follow specially for beginners and people who are not South Indians but wants to do pooja as in law's house they do it every year. 1st year my mother in law kept the idol and I kept the fast and did the aarti.. This year m staying away from family, so I kept the kalasam. Did I make any mistake by keeping the kalasam on my 2nd year? And after pooja when do we remove the idol? Hi, Thanks. Generally people keep it on first, third like odd number years. But if its done with devotion, don't worry about it :) Its not a harm. You can remove the idol on Saturday morning.If not, remove on Sunday morning. ie. the third day. Hi Thank u very much for posting the detailed procedure.I got a clear picture now.I have few doubts.If I am planning to give tambulam for 9 ladies.Will it includes me ? Hi, Thanks. It is not including you. You can give to 9 or 11 ladies other than you. Hi Chitra. I am from Karnataka and my question is whether the number of women offered tambulam after Pooja should be 5 or any fixed number and if I can also take the same from my sister if I got only 2 or 4 sumanalis? Is it right if I am doing Pooja and offered tambulam of the same Pooja? Hi, I asked my friends regarding your query. They said, there is no hard and fast rule of giving thamboolam to ladies in odd or even count. So you can give for people who visit your place. Usually people don't take thaamboolam from their own home after doing pooja by themselves. So I am not sure about this. Is it compulsory to place goddess Lakshmi idol only at East face? East is the best if not North is fine. Hi, my mother wants to start varallakshmi vratham at home. There is no practice in both my grandmother's house. Can she start it this year on her own and will it have any impact? Hi, She can start. No problem. If you know anyone already doing this pooja (May be your neighbor or friends), ask them to help you with procedures and tell her to give the kalasha to your moms hand and start it. If its not possible, no issues. She can do it on her own. Anything done whole heartedly to God have a good impact :) All the best ! Good post. 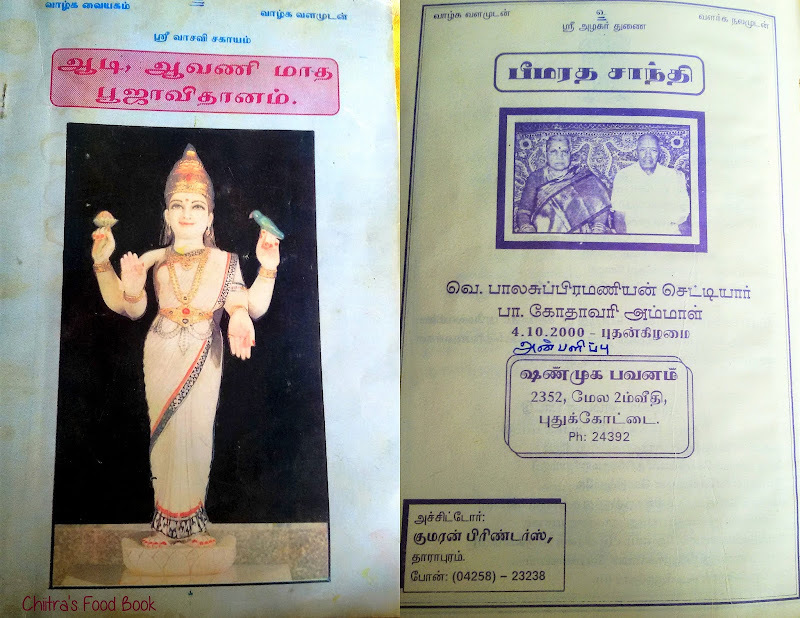 Where can we get that “Aadi, Avani maadha Pooja Vidhanam” book? Once I saw that book in book exhibition. But I missed it. Pls help us if you know? Hi, Sorry. I am not sure about it. you can try in Giri. If you are not able to do this Pooja in an elaborate way, just do in a simple way. On the festival day, take out Amman moham and keep in silver glass or panchatram with rice, tambulam, coin in it in silver or peetalai / brass plate with banana leaf below. Yellow thread should be kept in amman, neivedyam should be done with fruits, beetal leaf, supari, manjal. After that tie sharadu in your right hand. As you are doing it for 9 years, please don't stop it. If you are not able to do this simple Pooja too, then keep the Amman face in kalasam filled with rice in the Pooja room itself. Just do a simple neivedyam like every other day. Unmarried girl should perform this pooja? I want to do varalakshmi pooja starting this year but few people are saying not to do if don’t have the practice of doing it on husband side . So I am confused now whether to do it or not ? I already brought the Amman face - What should I do on this Friday? Can I just decorate the Amman face with new blouse without kalasam and nonbu Saradu and give thambulam to ladies .please help me on this . No problem. I have seen many of my friends doing it on their own interest even if its not a family practice. If you are really worried about your friends opnion, just ask your nieghbor or any relatives who is doing this pooja to start it by giving amman face to your hands or keep it in kalasam. i.e Avangala eduthu kuduka sollunga. Its like you are taking the pooja from them so that you can continue every year. Hope I have cleared your doubts. Thank you so much Chitra! Very nicely explained in patient and detailed way. Mam what I have to do that coconut after pooja...when I have to dismantle kalasa.this is my first year of pooja. It's mentioned in the end of the post. You can use the coconut in your cooking. Make some sweets or use in regular cooking. hi Chitra nice post.. What should we do with the coconut? You can use it in your cooking or make sweets with it.